Paris, Musée du Luxembourg, from 5 April to 15 July 2012. Since then, the management of the Musée du Sénat has changed, with the Réunion des Musées Nationaux taking over the institution’s operations. And, though the lighting engineer seems to still be the same one since the exhibition, as was so often the case in the past, engulfs us in relative darkness while the works however receive a violent and direct light, the overall effect has nevertheless improved significantly. The setting is understated but enhances the works in a remarkable way, the selection of paintings is limited but pertinent, covering the artist’s entire career and, finally, a very fine catalogue is available, all resulting in a beautiful tribute to one of the best artists from the turn of the 16th century in Venice. Our only question concerns the RMN’s choice of (paid ?) advertising, done in extremely poor taste, visible notably on Dailymotion and which we will not comment further except to say that it could - at best - have been humorous if created by a parodist but that it is consternating to see it coming from the RMN. Let us move on rather to a discussion of an exhibition where we can focus on the artist. We say this as opposed to the show on Artemisia Gentileschi or, to use an example closer to Cima da Conegliano, that of Giovanni Bellini in Rome where the main subject seemed to be almost exclusively, secondary, questions of attributions - after all, how can one study an artist based on works which are perhaps not his ? - because the retrospective at the Musée du Luxembourg exhibits essentially paintings with acknowledged authorship. Art history anthologies generally highlight the glory of Giovanni Bellini, Giorgione, Titian. Although this artistic filiation is indeed accurate, it nevertheless remains simplistic. Venetian painting is a complex domain including artists from nearby cities such as Verona, Mantova and Vicenza as well as others from more far-flung places like Antonello who left a profound impression on the art of this city. The RMN should be commended for helping us to discover a remarkable painter whose name is largely ignored by the general public although art lovers know him well. Cima da Conegliano, though not as famous as Giovanni Bellini, is truly one of the finest artists of his time. The exhibition begins with one of his first works, a large altarpiece which already embodies all of his art. 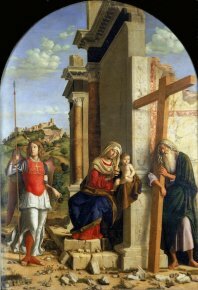 Produced for a church in Vicenza, it now resides in the city’s art museum, and the influence of Giovanni Bellini , present in much of his oeuvre, is patent. 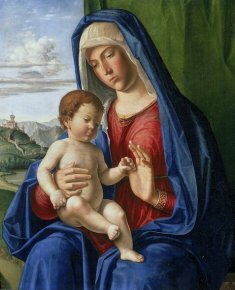 Although his training remains mysterious, it is thought he studied under the master at one point and obviously shared his taste for small sized renditions of Virgin with Child, painted against a landscaped background, at times partly concealed by a curtain with the child Jesus often appearing on the ledge in the foreground. Two examples are shown immediately alongside, one from the Uffizi (ill. 1), the other from the Pinacoteca in Bologna. Besides Bellini, this important early altarpiece also reveals the artist’s debt to Mantova art and its taste for architectural scenes often ornated with decorative motifs (here a vine) and a perspective inherited from the Florentine Quattrocento. But should we not also include among his, direct or indirect, sources of influence Piero della Francesca ? 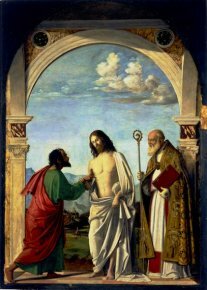 Certain paintings here, such as Saint Thomas’ Incredulity from the Accademia in Venice (ill. 2), appear to share this artist’s same monumentality and similar colors found, for example, in Christ’s Baptism (National Gallery of London). True, as the catalogue explains, Cima da Conegliano’s stylistic evolution was rather limited, making it sometimes difficult to date the works. 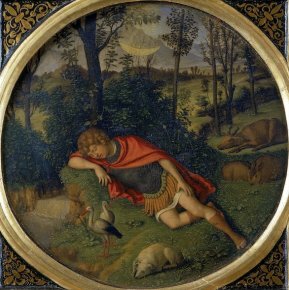 This is especially so if comparing him to Giovanni Bellini who completed the full transition between Alvise Vivarini and Giorgione, notably with his last masterpiece Noah’s Drunkenness from Besançon. However, although Cima da Conegliano’s career was much shorter than the master’s, the exhibition shows a very different manner in some of his late works, such as Saint Jerome from the Uffizi and The Virgin Nursing the Child in a Landscape from the Rijksmuseum, as opposed to that appearing in the models mentioned above. Despite its poor condition, the second work shows us a glimpse of the potential changes his art might have attained, approaching the poetry found in Giorgione and Titian. We could continue indefinitely on the subject of the various influences affecting the artist, from Dürer whom he met and seemed to have also inspired when the German artist traveled to Venice, to Vittore Carpaccio irresistibly evoked in paintings, unfortunately missing here such as A Miracle of Saint Mark, the Healing of Anian from Berlin and The Presentation of the Virgin at the Temple from Dresden, but including also Antonello da Messina. This would however be assimilating Cima da Conegliano’s talent to that of a follower or imitator which he never was. The exhibition demonstrates that he is to be appreciated first of all for his own originality and a talent which, in some works, verges on genius. 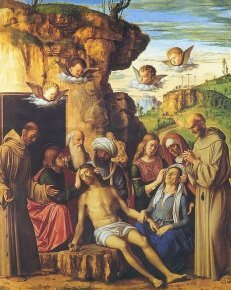 This is the case, for example, in The Lamentation of Christ Dead between Saint Francis and Saint Bernard (ill. 3) from the Galleria Estense in Modena, a panel commissioned in 1495 by a lord from Carpi, Alberto Pio. The text in the catalogue correctly points out the comparison to be made with the large terracotta sculptures found in Modena and the region, notably by Niccolo dell’Arca and Guido Mazzoni. The despair of the Virgin who has fainted and has her head held by Mary Magdalene, echoed by Saint John holding Christ’s, imparts an expressionist caracheter to this scene rarely found elsewhere in Cima’s work but which is immediately offset by the more serene sadness of the other figures. The exhibition’s main room displays some masterpieces : The Virgin with Child between Saint Michael, Archangel and Saint Andrew, Apostle (ill. 4), with its extraordinary equilibrium, in the landscape and the architecture, as well as in the figures, the refined colors and the subtle symbolism whose humanist elements are perfectly analyzed in the catalogue ; Christ’s Baptism mentioned earlier ; a small tondo representing Endymion Sleeping (ill. 5), an unusual example of a profane subject for an artist who was essentially a religious painter, as well as other Virgins with child, one of which resides at the Petit Palais in Paris. One of the artist’s most interesting aspects is his connection to sculpture. We have already mentioned the case of the Lamentation but the catalogue also points out his ties to the Lombardo brothers, principally Tullio, visible notably in the many Saint Sebastian images painted by Cima da Conegliano. On this subject, the exhibition displays the beautiful panel from Strasbourg (ill. 6), accompanied by a Saint Roch from the church of San Rocco in Mestre both of which were part of the triptych, alas impossible to reassemble here, whose central piece - Saint Catherine of Alexandria - is in the Wallace Collection. We have already mentioned the catalogue several times. Written by the artist’s specialist, Giovanni Carlo Federico Villa, it offers three essays, with the first one covering the work of Cima da Conegliano, the second the critical reviews but which in fact provides a very detailed analysis of his technique, and the third summarizing the main sources which allow us to reconstitute his life. The lack of actual entries, which we usually regret, is not really a problem here since the paintings shown are studied in very clear paragraphs in the first essay . In fact, it looks in a more general way at Cima’s art, also treating pictures which are not present in the exhibition in the same thorough manner. This allows us to imagine what the ideal exhibition might have looked like, an impossible dream of course as it would imply assembling over twice as many works. We must repeat, though, that this retrospective at the Musée du Luxembourg is of such fine quality that it is sure to draw many art enthusiasts. Curator : Giovanni Carlo Federico Villa. Giovanni Carlo Federico Villa, Cima da Conegliano. Maître de la Renaissance vénitienne, Editions de la RMNGP, 2012, 232 p., 39€. ISBN : 9782711859900. Visitor information : Musée du Luxembourg, 19 rue de Vaugirard, 75006 Paris. Tel : +33 (0)1 40 13 62 00. Open every day from 10 a.m. to 7:30 p.m., Friday until 10 p.m. Admission : 11€ (reduced : 7.50€).